Summer means fresh mint teas. Cool and refresh your spirit, a tasty reward for a hard working gardener, or just the thing for lazy summer afternoons. Recipe Instructions: Herbal Tea :The delicate flavor is best expressed from fresh leaves when made as a sun tea. 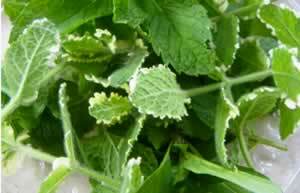 Chop or cut mint and basil leaves and cover with distilled water in a clear glass jar. Steep in a sunny location for 3 to 4 hours. Garnish with fresh lemon/and or a sprig of mint.